Our first attempt. Not pretty, but very functional. rocket stove. 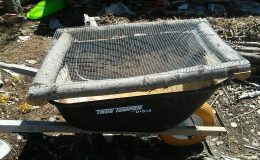 The one that we built was simple, but cost us $60 for fire brick. We spent the money because we were in an hurry to be able to cook, but you can build this much cheaper. 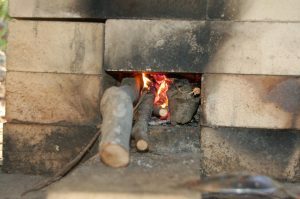 What is a rocket mass stove? 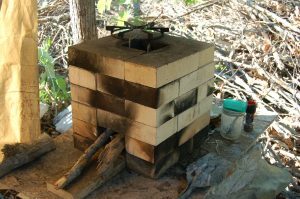 A rocket stove is a burner that uses sticks and other small pieces of wood to produce the heat for cooking. You feed the sticks in sideways and they burn upwards into an insulated combustion chamber/chimney. The insulation allows the stove to be super efficient because the hot temperatures lead to almost complete combustion inside the stove. I especially like the part where it uses sticks for fuel. 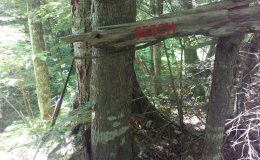 We have an over abundance of sticks where we are, we could not possibly ever run out of rocket stove fuel. 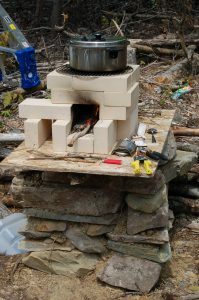 Our rocket mass stove was very simple to build. We stacked up firebricks so that there was an opening in the front to feed the sticks in and the other end of the opening was on top where the flames pop out. The platform is the stack of rocks I had mentioned before that was supposed to be my platform for my rain barrel. I was then convinced that it was the perfect spot for the rocket stove and so I built a new platform for the rain barrel. After we re-stacked the firebricks we were left with the random soot pattern on the new stove. Makes it look kind of artistic, don’t you think? We found the burner cover at a local thrift store, 5 for $5. It gives just enough height for a beautiful burn. If you notice to the left, we hung shower curtains on both sides of the kitchen around the stove to allow us to cook in the rain. They roll up nicely when the sun is shining. It took me a little practice to learn to light the fire. We tend to use birch bark and evergreen twigs to get it going. Once it’s lit, any dry sticks will do. Once the bricks heat up, you can easily burn damp wood as well. This comes in handy when you have to cook outside all the time. If you notice in the pictures, there are always sticks poking out of the front of the burn chamber. This is something that I believe is unique to rocket stoves and rocket mass heaters. As the sticks burn down, you just feed them in more to keep the fire going. I can easily use sticks that are 2-3 feet long and keep the fire going by just advancing the sticks. You do have to keep an eye on the fire, it needs to be fed fairly often, but not to the point that I find it annoying. Unless of course the kids are going crazy and you have to stop cooking to redirect them. If the fire does go out, it is usually pretty easy to relight once the bricks are hot. This particular stove is nothing spectacular, but it works very well. 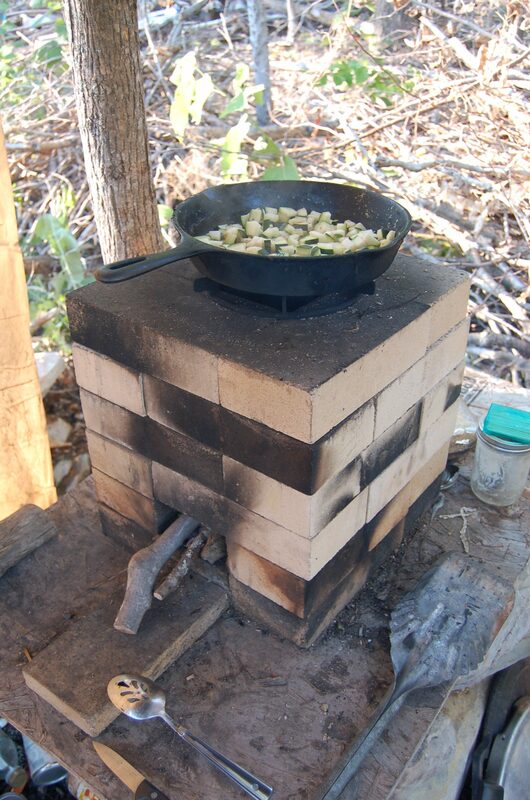 When I have the luxury of some more time, I will attempt a much nicer, and cheaper version of the stove. I don’t have that right now, so this will have to keep us fed until I do. If you do some searching, you can find plenty of varieties of rocket stoves all the way from cut up soup cans to clay and mosaic tiled. I guarantee there is one out there that you would love! 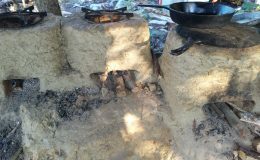 Check out my cob rocket stove here. For links to other rocket stoves and some other heating and cooking ideas, click here. When are you coming up for a cookout? I’m building a pizza oven eventually. Jack who?